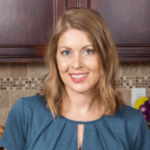 Published: Mar 9, 2017 · Modified: Apr 12, 2019 · By Jen Sobjack · This post may contain affiliate links. 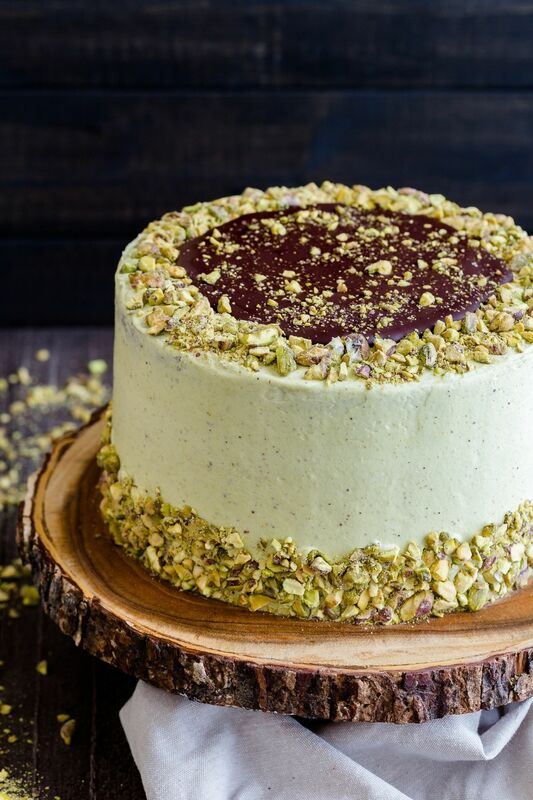 This layered Chocolate Pistachio Cake will turn heads! 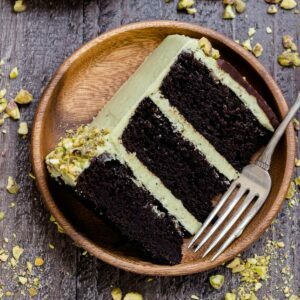 Rich decadent chocolate cake slathered in light, creamy pistachio frosting. It looks just as good as it tastes. 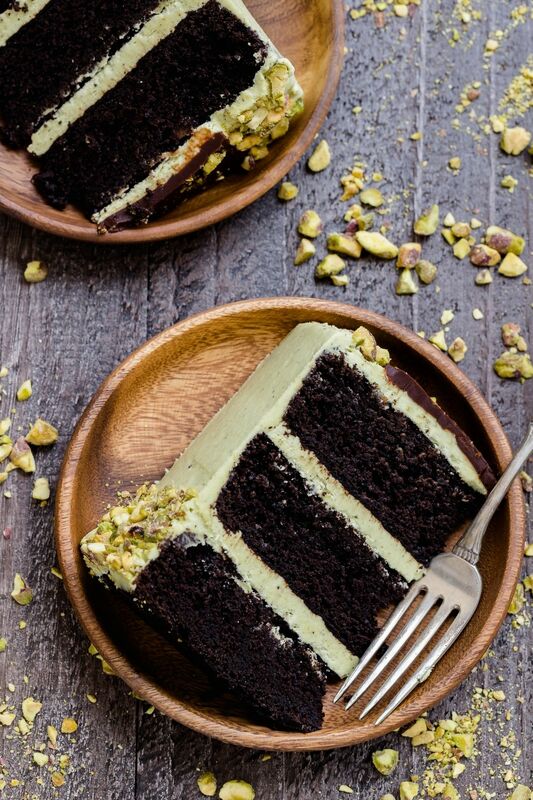 A luscious chocolate ganache rests on top of the cake with a ring of crushed pistachios encasing it. It’s a chocolate lover’s dream! It’s starting to feel like spring here already. Currently, the windows are open and the sun is filling the office as I work. Oh, how I’ve missed these gorgeous days. The weather has me craving time away. Maybe somewhere tropical. Somewhere warm. That’s exactly what I’ll be doing at the end of the month. We’re sailing away on a 10 cruise and I. Can’t. Wait. I’ve been busy planning enough recipes and posts to keep the blog afloat while we travel. And there’s been so much chocolate! Earlier this week I shared these homemade thin mints. And now this glorious chocolate pistachio cake. This is a mega chocolate cake! So full of rich chocolaty goodness but balanced with a light pistachio buttercream. It’s perfection. While this chocolate pistachio cake looks extravagant and difficult, it’s actually really simple. I turned to my favorite chocolate cake base. It’s the same one used for this peppermint fudge cake. The chocolate batter contains both cocoa powder and melted chocolate which is enhanced with some strong brewed coffee. If you’d rather not add coffee to the cake, you can replace it with buttermilk. After you bake the chocolate cake layers, it’s time to cover them with frosting. 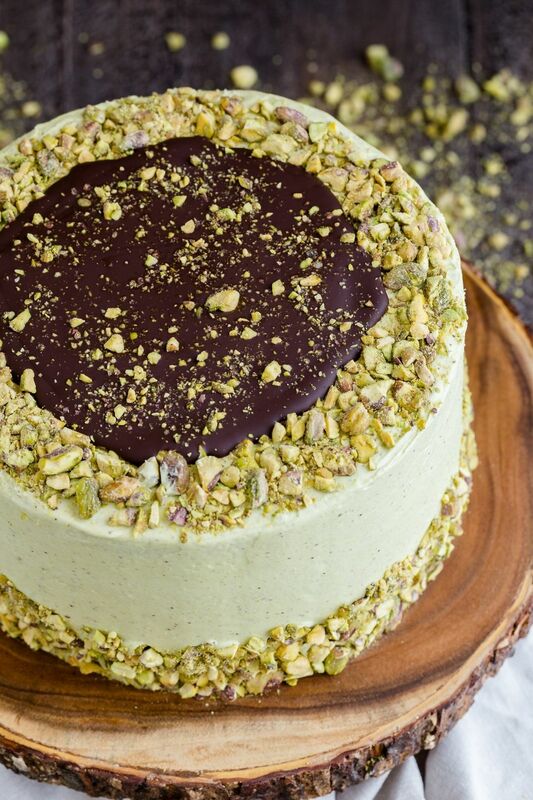 I am loving this pistachio frosting. It’s incredible. You need unsalted shelled pistachios and a strong food processor. Follow the steps for making homemade almond butter and grind the pistachios into a paste. Make a basic vanilla buttercream frosting and stir the pistachio paste in at the very end. I like to add a drop of green food coloring also, but this is totally optional. Make sure the cake is completely cool then spread some frosting in between each layer and cover the entire cake with the remaining frosting. Finish the cake with chocolate ganache and crushed pistachios. In a food processor, process the pistachios until they become coarsely ground. Stop and scrape down the sides of the bowl. Add the oil if the pistachios aren’t breaking down easily. Continue to blend for 25-30 minutes, stopping and scraping down the sides as needed throughout the process until smooth and creamy. Set aside. Add 2 cups of confectioner’s sugar, beat on medium-low speed until most of the sugar is moistened. Gradually add in the remaining sugar, one cup at a time. You may need more or less depending on how soft the butter is. Beat on medium-low speed until the sugar is moistened. Turn the speed up to medium-high and beat until light and fluffy. Scrape down the sides of the bowl as needed. Add the pistachio paste and food coloring. Mix until well combined. Place one cake layer onto a serving platter. Add a generous amount of frosting and spread it to the edge with a spatula. Repeat with a second cake layer, topping it with a generous amount of frosting. Add the third cake layer and cover the top and sides of cake with frosting. Press chopped pistachios into the sides of the cake near the bottom and coming up less than halfway. Sprinkle pistachios over the outer edge on top of the cake creating a 1-inch border. Set the cake in the freezer for 10 minutes. Spoon the ganache over the top of the cake in the center of the pistachio border. Use the back of the spoon to create a smooth layer of ganache. Set the cake back into the freezer for 10 minutes. This cake was amazing! I rarely write reviews but I just wanted to say thanks for the awesome recipe! Thanks, Gayle! I’m happy to hear you loved the recipe! Made this. Amazing. Might be the best thing I’ve ever made. I used more pistachios than it said to. And I didn’t need any food colouring to make it green! That’s fantastic! Thank you for sharing! What a great cake! I made this for a 75th birthday party. It turned out perfect, and everyone loved it. I skipped the coffee, and put strawberry slices between each layer, and on top of the ganache. It’s was so delicious! Thanks for sharing the recipe! I love the addition of strawberries! I love almonds and I am going to try to make this cake using almond butter as a substitute for the pistachios. If I thought my food processor could handle this I would make the pistachio version. Happy baking. When my brother asked for a chocolate pistachio cake for his birthday, I thought he was joking. But he wasn’t, so I found this recipe. Honestly, Jen, this was the only recipe that caught my eye. Your cake is polished and beautiful. I made only a couple of minor changes to the recipe. I used cake flour (sifted) instead of all-purpose and made the ganache with just melted chocolate and heavy cream. I used about 3 1/2 cups of powdered sugar in the frosting (which was delicious). Also, I could only process the pistachios for a couple of minutes before they started sticking to the sides of the food processor, which was fine by me. I was afraid that the frosting would be too grainy, but the pieces were small enough that it didn’t bother anyone. Everyone loved this cake. I make desserts for my family pretty frequently and everyone agreed that this was their favorite one yet. This is going to be my new go-to recipe for chocolate cake… It’s so good. I really enjoy your site. Thank you ! This looks amazing! I love dark chocolate and pistachios together.